» Grilled Salmon over Avocado Salsa Grilled Salmon over Avocado Salsa | Gluten Free Daily | Weight loss. Wellness. Fitness. Preheat oven to 350 degrees. Spray one side of a sheet of aluminum foil large enough to fold over all the salmon with olive oil spray. Arrange salmon on the prepared side of the foil. Sprinkle each side with a pinch salt, pepper, and garlic. Fold foil over salmon to enclose. Toss together tomato, celery, olive oil, and capers in a bowl. Gently fold in diced avocado and diced cilantro. Season with salt and juice from one lime wedge. 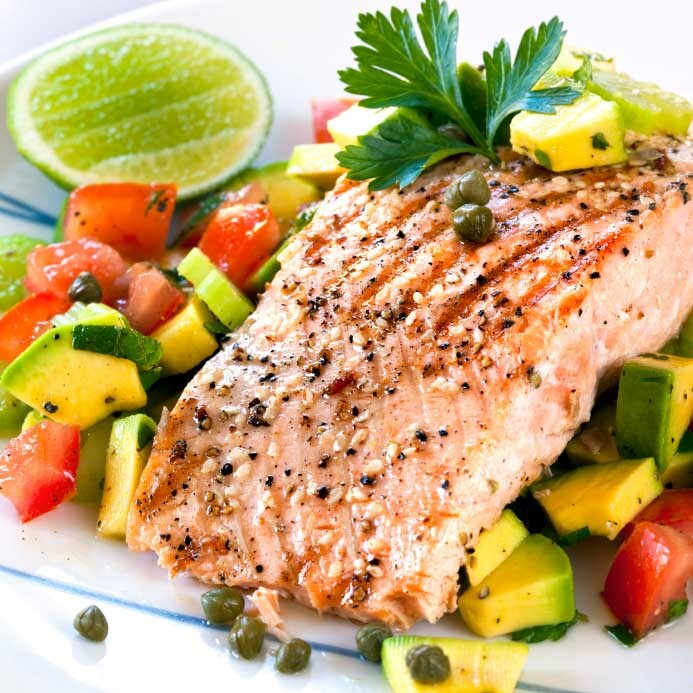 Layer dish with Avocado salsa on the bottom, then place salmon directly on top. Enjoy!